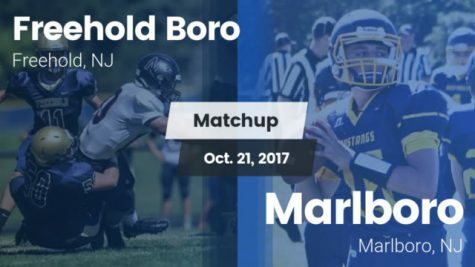 Saturday, September 9th Freehold Boro kicked off their season against crosstown rival Freehold Township at home. 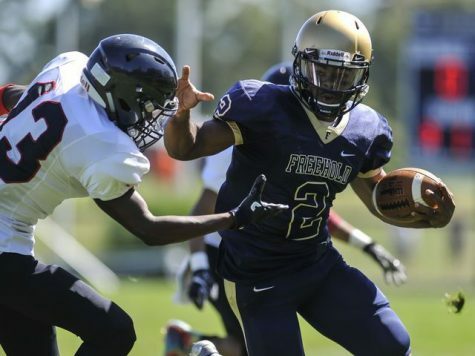 The first game of the season is always a mystery for fans, that is especially true for varsity football. Seniors graduate, new freshmen come in and fortunately for the Colonials, last year’s freshmen, sophomores and juniors have seemed to improve quite a bit. The Colonials’ defense looked strong with two interceptions, both taken by junior Matt Kraus, two safeties, and four sacks for lost yards. The offense was dominated by Ashante Worthy now wearing number two- in the past he had worn number four. He took the snap for most of the plays during the game, the only exceptions were the two times he was sidelined once where he seemed to have had discomfort in his leg and another where he simply had the wind knocked out of him. The screen pass was used quite frequently by the Colonials, and the run game was quite strong as well. The quarterback taking it himself a few times and JJ Hair, the Colonials starting RB also taking it. Worthy’s stiff arm was on point Saturday afternoon bringing several Patriot defenders down to the ground, allowing him a clear path to run. 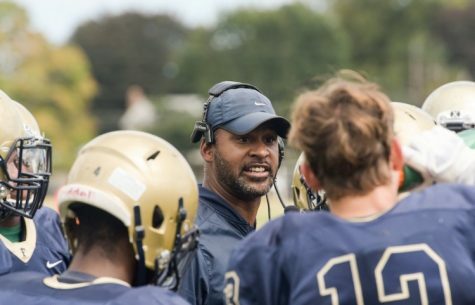 Quincy Davis was a favorite target for Worthy, his ability to free himself from his defenders was key to the offense and a big reason the Colonials scored 49. 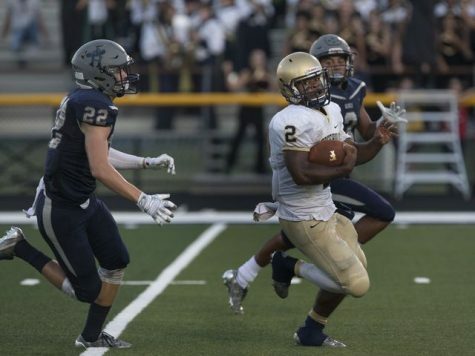 Worthy had 461 yards on the day, about 230 in both rushing and passing. Davis caught two touchdowns, Krauss caught two and J.J. 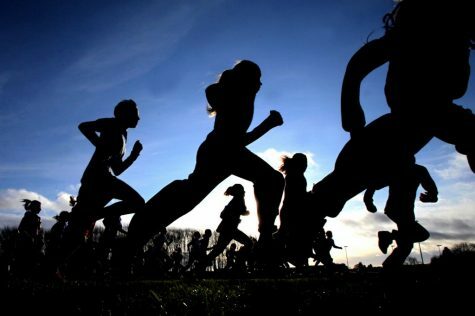 Hair ran in two, Worthy ran in one himself. Thanks to the Offensive Line, the Boro had time to throw, run and hence score. The Colonial kicker, Jake Hurler looked sharp on kickoffs for the most part and missed no extra points. But did miss his only field goal attempt. 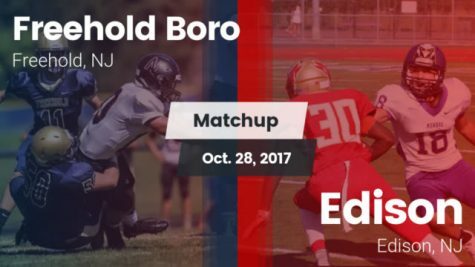 Overall the Boro outplayed their crosstown rivals, who seemed to show only a few promising signs on their 2017-2018 season debut. Medium and long passes up the middle were completed a few times by the Patriots, and they did still score three touchdowns, all passing. Their biggest problem on offense is their lack of a Line. This allowed the Colonials to come in and hit the quarterback time after time. Oftentimes his only option was to take the hit. 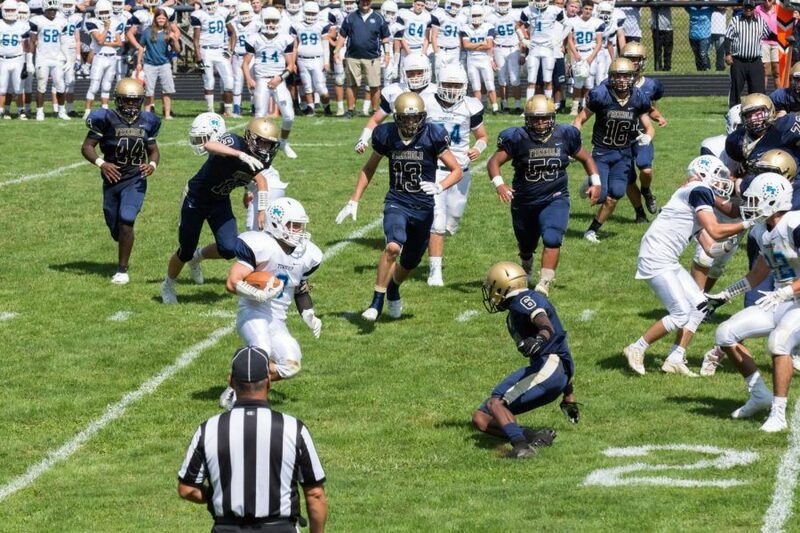 Freehold Township’s defense, or lack thereof proved to be confused against the Boro’s unorthodox offense- with a star running back, turned quarter back taking all the snaps. Their defensive line couldn’t penetrate to reach Worthy, nor could they cover Davis who seemed to outmatch his defender throughout the game. In the third quarter Kenny Tomkovich went down with an apparent leg or ankle injury. He missed the whole season last year with a torn ACL. He was helped by his teammates to shake hands at the end of the game, but was taken off the field on the golf cart. His status will be updated as soon as information becomes more clear. In the end it was a good day for the Colonials, the Duke- the famed trophy was handed to the game’s star Worthy who kissed it and celebrated with the rest of his team out on the field. 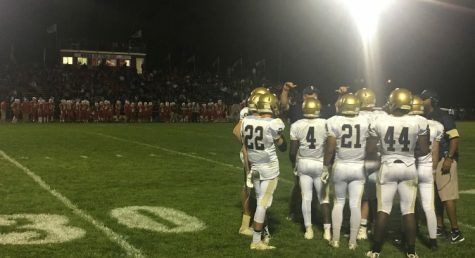 The trophy would stay in the main office until the Boro had to forfeit it over to their crosstown rival who technically won the game due to academic dishonesty on the Colonial sideline. 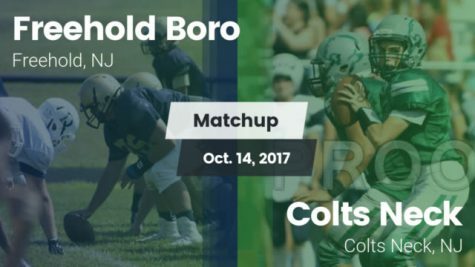 The Boro goes on to play Howell next week under the lights, and on their newly renovated turf field.